The Attic Master, is the Kwikool© commercial 13,700 BTU 115v ambient spot cooler you are looking for. 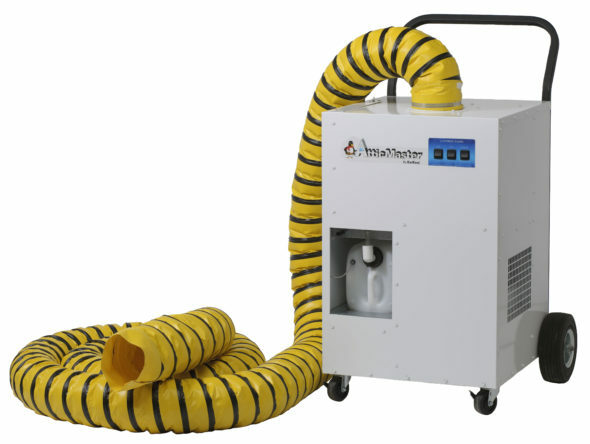 The Attic Master is a portable with high static air flow. 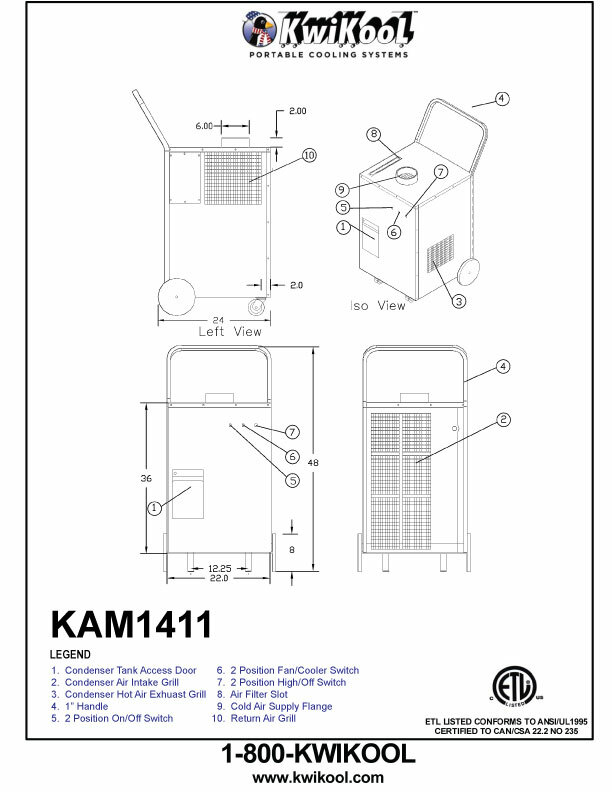 Designed to have an extremely small footprint, the KAM14 is ideal for spot cooling people and/or equipment in high ambient environments, specifically attics and crawl spaces. One of the leading products in Kwikool’s Indoor/Outdoor Series. The Attic Master offers a quick and easy cooling solution for hard to reach and challenging spaces. The secret is placement. We recommend placing the unit in a cooler area, then running the duct to the high temperature area. The Attic Master’s high static capability is the secret! 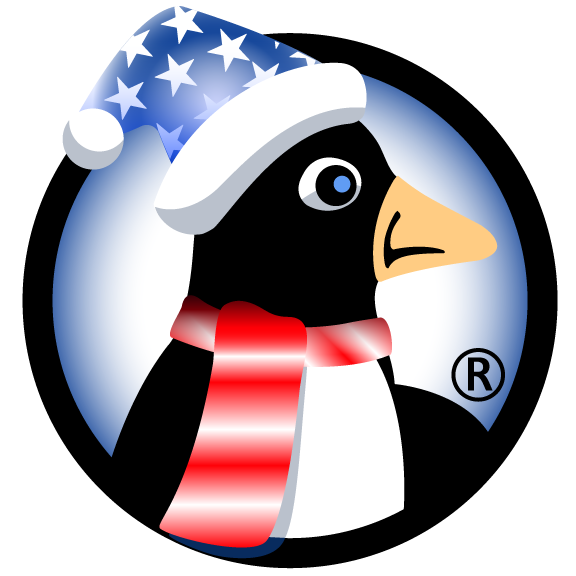 It can move cool air up to 90 feet through a specially designed insulated duct (6 inches in diameter) which will not form condensation. This little powerhouse comes with 30 feet of our Kwikool© non condensate duct right out of the box. However, if you need a longer reach, you can add up to 60 more feet, or two more sections of duct while maintaining the level of efficiency the KAM14 was designed for. The Attic Master runs on a standard 115-volt/15-amp circuit. The chord is 50 feet long which should be more than ample to a dedicated circuit. The KAM14 is also designed with a 3.5-gallon interior condensate tank which requires someone to manually empty on occasion. The float activated condensate tank will cut off when it is full. This unit along with the single duct ceiling kit is installed in less than ten minutes. It’s heavy duty wheels and handle make it a rugged, companion for moving from job to job. Suitable for light commercial applications, these easy-rolling, relatively small units help provide cooling where larger commercial air conditioners are not practical. Constructed of galvanized steel with an exclusive scratch-resistant finish, this reliable AC is engineered for use in hot ambient environments, such as your attic or workstation, and features an extremely small footprint to allow for convenient portability. 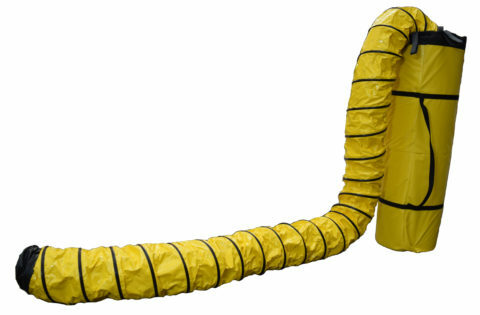 The high static capability can move cool air up to 90 feet through 6-inch ducting, which is specially designed to prevent unwanted condensation. Complete with convenient features like condensate overflow protection, automatic restart and three separate fan speeds, the KwiKool© Commercial Attic Master Spot Cooler will supply any space with a blast of cool relief. This is another example of Kwikool’s commitment to providing top-of-the-line products for every commercial situation. 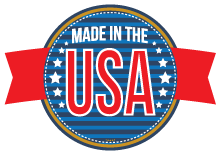 KwiKool products are proudly MADE IN AMERICA. Width x Depth x Height (Inches) 22" x 22" x 48"
Powerful blower moves cool air up to 90 feet.